Recorded in 1999 and released in 2000, Friday Night at Ego's Lounge is an original take on classic '60s instrumental surf rock combined with the flavors of Mancini-era spy tunes and '60s garage rock. Burnin’ Mike Vernon’s 3 Balls of Fire – "the men with the burning guitars" – have led the way for instrumental guitar bands in Austin since 1987. The popular trio from the Lone Star State perform original, high octane, road-tested, surf-drenched Texas twang. They dip into in surf guitar, hotrod music, lounge favorites, and cowboy exotica from the Sixties and their bluesy twang is incendiary. 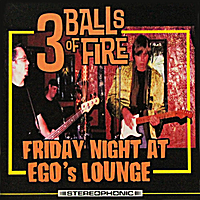 Recorded in 1999 and released in 2000, Friday Night at Ego's Lounge is a live album recorded at Austin's swankiest nightspot. Features 26 classics. A cool mix of instrumental surf, lounge, and rock & roll.